In the contemporary business world, the term ‘family-owned’ often prompts people to conjure up an image of some sort of mom-and-pop shop operation where business is done the old family way, with little ambition to compete against the industry’s big boys. While reaction is sometimes justified, it couldn’t be farther from the truth in the case of Alpha Poly Corporation. Better known as Alpha Poly Packaging Solutions, this Canadian family-owned manufacturer of flexible packaging for the nutraceutical, confectionary, bakery, produce, and lawn and garden segments doesn’t mind if the competition takes it lightly, as long as it keeps growing its market share. Located in Brampton, Ont., Alpha Poly was originally formed in 1989 as a producer of PE (polyethylene) bags for the waste management industry, i.e. garbage bags, if you will. 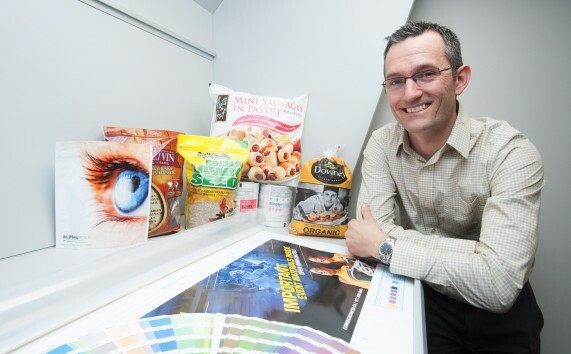 “Since our beginnings, we’ve diversified our company in an effort to grow our business, now producing printed flexible packaging in a myriad format of film choices and additional features,” Alpha Poly president Patrick Kerrigan (see photo above) told Canadian Packaging during a recent visit to the company’s state-of-the-art 53,000-square-foot facility. 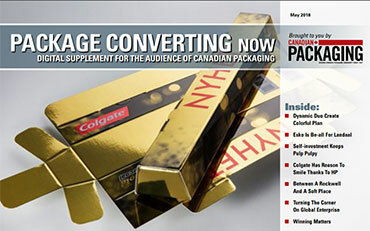 As a leading Canadian manufacturer of flexible packaging, Alpha Poly offers flexographic printing and in-house design capabilities, along with converting and laminating, to produce pre-printed laminated rollstock, MAP (modified atmosphere packaging), resealable bags, courier-style bags, high-barrier food packaging, various types of pouches, and lawn-and-garden bags. 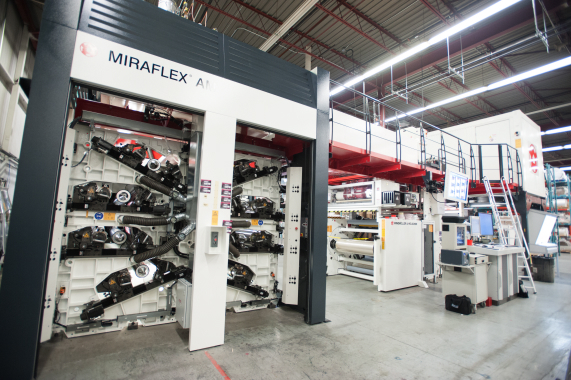 Manufactured by Windmoeller & Hoelscher, Alpha Poly’s new state-of-the-art Miraflex AM eight-color flexographic press was supplied by its Canadian distributor Webconverter Ltd. The one thing the company does not do, however, is actually extrude its own film. 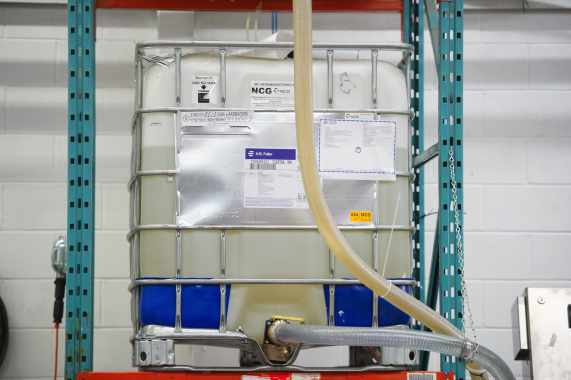 Instead, according to Kerrigan, it purchases rolls of PE, PET and oriented propylene films from Ontario, Quebec and Nova Scotia producers, and then further process that into the company’s high-quality flexible packaging products. “We sell our products to manufacturers who sell to processors or retailers, mostly in the retail and food industries, and we do a lot of private-label business,” Kerrigan reveals. While the company’s products are available coast-to-coast across Canada, Kerrigan notes that it has only just begun to reach into the U.S. markets. “For us, Alpha Poly is still small enough for every customer to get that hands-on advice, but we are also keen on adding high-quality employees to our business,” says Kerrigan. “I’ve noticed throughout the years that often one company will lose an employee only to pick up someone else from the same pool of talent,” he says. “But we don’t necessarily want someone coming in with pre-set ways of doing their work,” adds Kerrigan. “We like having people who listen to what the customer wants and can offer solutions no one has ever thought of before. “We let creative people be creative, which is why we don’t have a lot of turnover here,” he explains, suggesting that this might have something to do with people wanting to work for Alpha Poly. Kerrigan says the company’s success is rooted in creating relationships, and then working to ensure they become long-term relationships. “For our clients, we ensure they have a dedicated Alpha Poly customer service representative, along with a client solutions representative, to assist with new or special projects,” says Kerrigan. 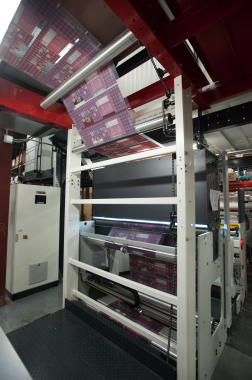 The cost-effective Miraflex AM flexographic press from W&H can accommodate print widths of 32 to 57 inches at speeds up to 1,300 feet per minute. “I can state unequivocally, that our entire team has a great sense of pride in the contribution to customer satisfaction,” he states. It’s a strategy that has paid off in a big way, he relates. “Even though this is a huge market, I think it’s probably more correct to note that we are actually a small company, but our next goal is to soon become a medium-sized player,” says Kerrigan. Currently, the company’s 50 employees work three-shifts-a-day, five-day-a-week production to convert some five million feet of film every month, or an equivalent of about 25 million bags. “I think it’s feasible—and it is our goal—to triple those numbers within the next three to five years, which is where our current capacity sits,” says Kerrigan. Kerrigan says that three years ago the company underwent a significant corporate transformation to create a better reflection of its business diversification. 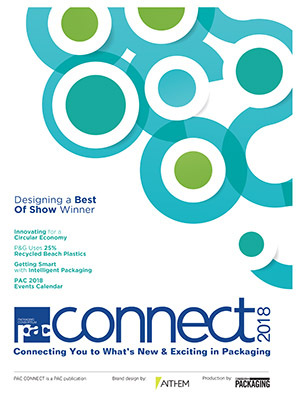 “We were known as Alpha Poly Bag then, but even then it was quite obvious that it simply did not describe who we were or what we did, which was to provide customers with a complete packaging solution,” he says. Kerrigan says that even with all that, having the proper equipment in place is a prerequisite for moving forward. “It’s very important for our employees to have the best equipment in the industry,” says Kerrigan. According to Kerrigan, new capital investments are an annual occurrence at Alpha Poly, always looking for new technology and equipment to improve the manner in which it does business. “We continually reinvest in ourselves to ensure we can continue to provide a high-end product while still offering competitive pricing—two things we are known for,” says Kerrigan, noting that Alpha Poly offers many value-added services through its in-house graphic art department. “Having our own in-house art department, really does make the pre-press process as seamless and effective as possible,” he says. Alpha Poly president Patrick Kerrigan (left) and graphic coordinator Glenn Correa review a print sample of the HD flexographic technology. Just a year ago, Alpha Poly completed a $3.5-million expansion that included adding a 20,000-square-foot warehouse. “The idea behind that was to actually free up some much needed space in our main plant for a bit of office renovation, and a lot more room for the manufacturing area,” Kerrigan reveals. With more room in the manufacturing area planned, Kerrigan knew it was time to begin to add some new equipment to help expand the customer base while taking even better care of the existing customers. 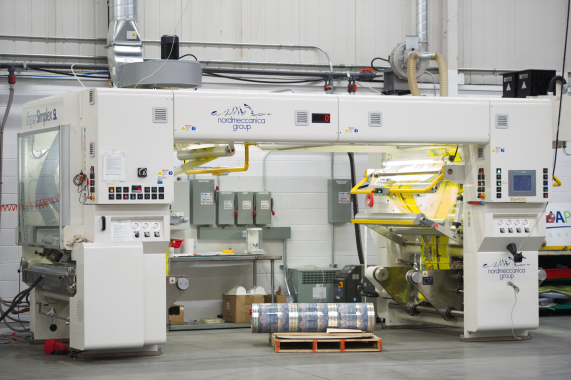 With that in mind, Alpha Poly added a new two-ply Super Simplex SL solventless laminator from Nordmeccanica SpA, using the latest quick-curing technology that allows it to use its brand new slitter from Deacro Industries Ltd. of Mississauga, ON. a mere three hours later. All-told, it allows pouch-making to begin after 24 hours with product fill available in 48 hours—giving Alpha Poly an incredibly short turnaround time for customer requests. This faster turnaround time is greatly aided by Flextra Fast, a solvent-free film laminating adhesive system for flexible packaging, manufactured by adhesives specialists H.B. Fuller, boasting incredibly quick cure times, while still being food safe. The technology of this adhesive system allows Alpha Poly to meet the requirements of customers without holding inventory for long periods of time, while also not requiring a hot room. By using this fast-curing system, H.B. Fuller says it improves its service to customers, reduces WIP (work in progress), minimizes storage space and improves scheduling. 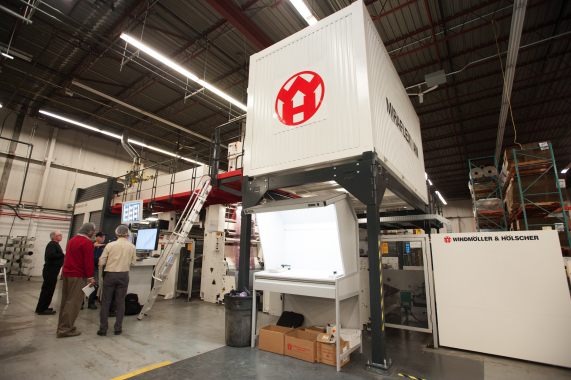 Needing a new flexographic press, Kerrigan turned to the expertise of the Toronto-based Webconvert Ltd., a well-established supplier of advanced converting machinery from the U.S. and Europe for the flexible packaging industry. The company represents some of the top suppliers to the packaging industry, including Enercon, Convertech, Montalvo and Schlumpf, and as of 2009 has become the exclusive sales representative in Canada for Windmoeller & Hoelscher Corporation (W&H). According to Webconvert president Dirk Kroll, his company and Alpha Poly first became partners back in 2004, when they wanted to get into printing business of plastic films, selling them their first six-color press. “Even with our previous relationship with Alpha Poly, I was impressed that Patrick Kerrigan hopped on a plane and traveled to Germany to personally see a W&H press and equipment from two other companies before making his decision that a W&H press was the best press for his company,” says Kroll. 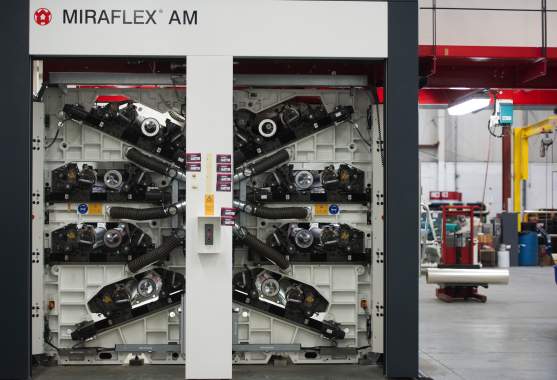 The eight-color Miraflex AM flexographic press has enabled Alpha Poly to increase its production speeds four-fold while presenting even higher quality graphics for customer products. Through Webconvert, Alpha Poly ordered a Miraflex AM 52-inch, eight-color flexographic press from the Lincoln, R.I.-based W&H. Delivered the day before last Christmas, the press was commissioned in January. 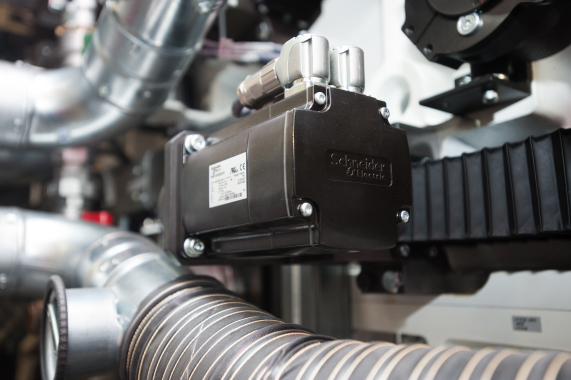 Manufactured in Germany by parent company Windmöller & Hölscher KG, the Miraflex AM is a cost-optimized press that offers the same power and performance of other W&H presses, with the chief difference being speed. Designed for maximum production speeds up to 1,300 feet per minute, it is over three times faster than Alpha Poly’s other press, according to Kerrigan. Printing widths on the Miraflex AM provide a great deal of flexibility to Alpha Poly, enabling them to print at 820-mm to 1,450-mm, with a maximum repeat width of 800-mm while printing on plastic film, paper and laminates. A Schneider Electric motor (below) embedded within the spider-like arms of the Mirafelx AM flexographic press. Kroll notes that the Miraflex flexographic presses from W&H are available in both eight- and 10-color versions, and have been the most successful range of presses ever sold by W&H, with over 300 machines installed worldwide since its launch in 2008. According to Kroll, the Miraflex benefits from a highly developed mechanical design for utmost stability required for quality printing at high speeds. The press’s high speed and quick changeovers are achieved with the Turboclean inking and washup system, along with productivity-enhancing features such as East Set HD for automatic impression setting and 3D plate topography and Easy Reg S for automatic register pre-setting. As part of its most recent major capital expenditure upgrades, Alpha Poly purchased a brand new Nordmeccanica Super Simplex SL two-ply solventless adhesive laminating machine. 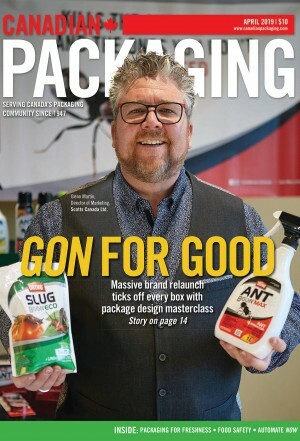 With sustainability also being important to Alpha Poly, Kerrigan says the company joined PACNext, a PAC Packaging Consortium-led project aimed at helping the industry transition itself towards a world without packaging waste. 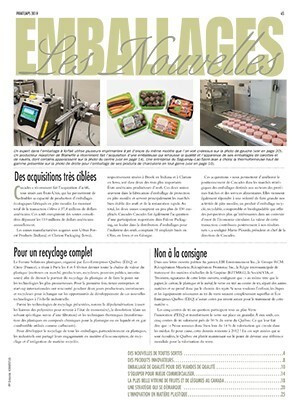 “We joined to try and help provide insight on how to deal with laminates in landfill or sorting at the recycling facilities,” Kerrigan explains, adding that 95 per cent of the packaging Alpha Poly manufactures is end-user recyclable with existing municipal recycling programs. “Moreover, 95 percent of all the scrap that comes out of our production process is picked up by WasteCo. and sent for recycling into new useable plastic, which means less dependence on raw materials,” he adds. 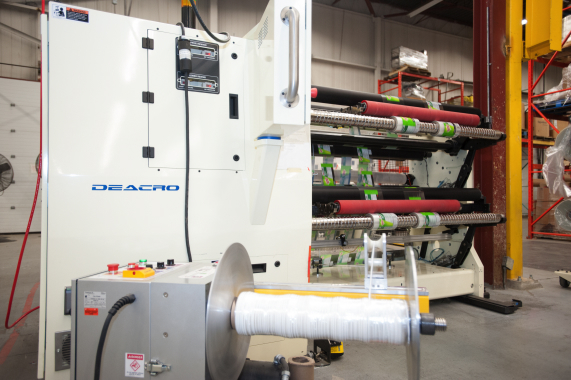 A slitter manufactured by Deacro Industries is key to helping Alpha Poly achieve faster turnaround speeds for its customers. The company also does its part with internal sustainability, with in-house recycling programs, and programmable thermostats to reduce energy consumption during non-business hours. To that end, Alpha Poly changed the facility lighting to more energy efficient lights—converting to T-8 lights to reduce energy consumption by 36 per cent, while increasing bulb life by 6,000 hours—and digitizing much of its manual process to reduce paper consumption by over 20 per cent. Another part of its sustainability initiative involves Alpha Poly promoting environmentally sustainable products like compostable, biodegradable bags made from recycled plastic. Alpha Poly’s OXO Biodegradeable bags feature special film that contains an additive that provides a time-specified breakdown of the polymer molecules into carbon when exposed to heat, light, air or even stress. 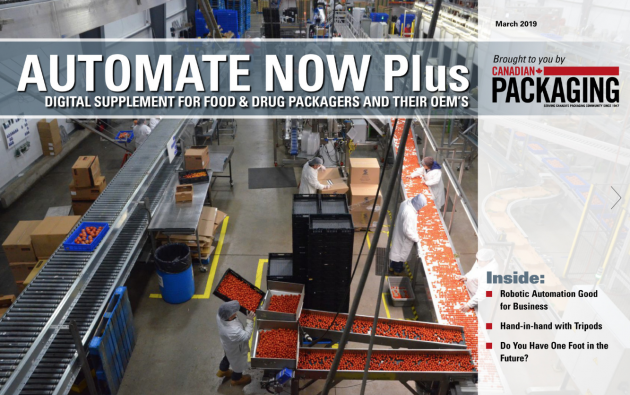 “We also offer custom features that provide customers and their consumers with re-use functions such as reclosable zippers, resealable tape and die-cut handles,” notes Kerrigan. Alpha Poly utilizes H.B. Fuller’s Flextra, a solvent-less adhesive to provide an extremely short turnaround time for its flexible packaging products. Kerrigan notes that Alpha Poly is also a member of IFS PACsecure, a PAC, Packaging Consortium and IFS Management jointly-developed food safety standard certification for primary and secondary packaging materials benchmarked to the Global Food Safety Initiative (GFSI) system. Gaining the IFS PACsecure standard means that customers can be sure that their products, such as Alpha Poly’s packaging, have been manufactured to meet the highest food safety standards possible. “We believe that IFS PACsecure is the golden, world-class standard for us and our customers,” Kerrigan states. “We are always looking at the next step and how we can move forward in the way we can do business. “We continually look at our processes and people and ask ourselves how we can get better,” he adds. “With the recent capital expenditure on the new W&H Miraflex AM flexographic press and other great equipment, we have taken that next step to ensure that we can continue to improve the way we manufacture our products for our customers,” Kerrigan sums up.